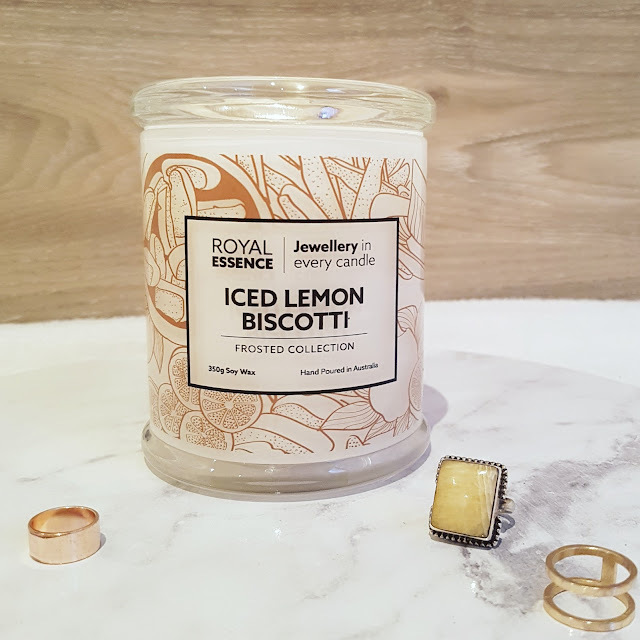 You guys all know I didn't start blogging just to rake in free stuff but it's still a lovely perk to be gifted items and when Royal Essence got in touch to offer me a Ring Candle from their range, I was legit excited. I enjoy candles (which is great because since I've been blogging, I've amassed at least six of them as a direct result) and I also enjoy surprises. I'd heard about ring candles before and the concept appealed greatly. Sure, I told myself, the jewellery inside might not be to my taste but there is a RING! Hidden inside a CANDLE! And you have to wait until it burns down to see what it is!! FUN! It was quite difficult to make my choice from the Royal Essence selection and I dithered for quite a long time between Cinnamon Doughnuts and Cappucino because I am a sucker for both smells but finally I chose Iced Lemon Biscotti which I figured would give me the baked goods scent I always go for, with the added zing of citrus to add a bit of difference. Every ring candle has a surprise ring (obvs) inside, valued between $10 and $2000. It comes complete with a tag telling you what it is and how much it's worth, safely chilling in an aluminium packet, waiting to be discovered. You can see some of the reveal photos on the Royal Essence Facebook page. Here I am in starring in my very own Ring Candle Reveal video. Not featured: me digging around the hot wax with a potato masher. "Hi Beth! Congratulations in finding a Tier 2 jewel. You have discovered a 92.5 Sterling Silver* Ring with Swarovski Elements, RRP $150"
* In the video, I say white gold but you know, whatevs. The quality of this candle is worth the bucks on its own. It's hefty, comes in a big old glass jar that's poured right here in Australia (#supportlocal!) 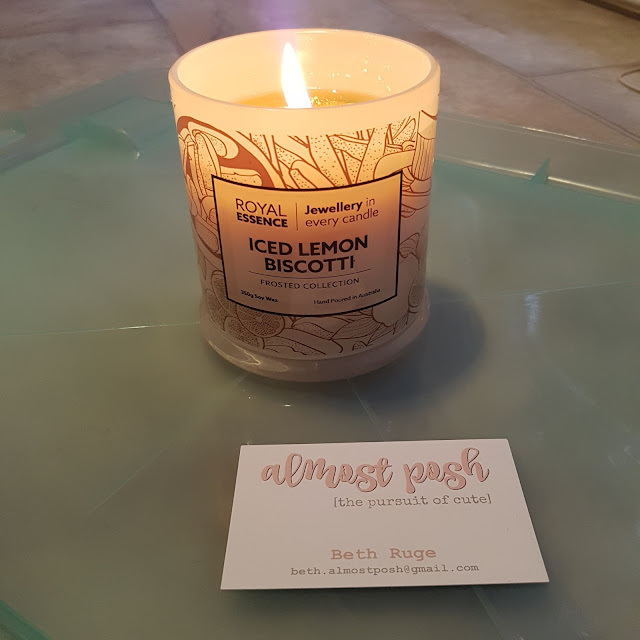 and is highly fragranced. If I buy a scented candle then by jove, I want it to SMELL. Is this something you'd get into? Have you ever had a ring candle? 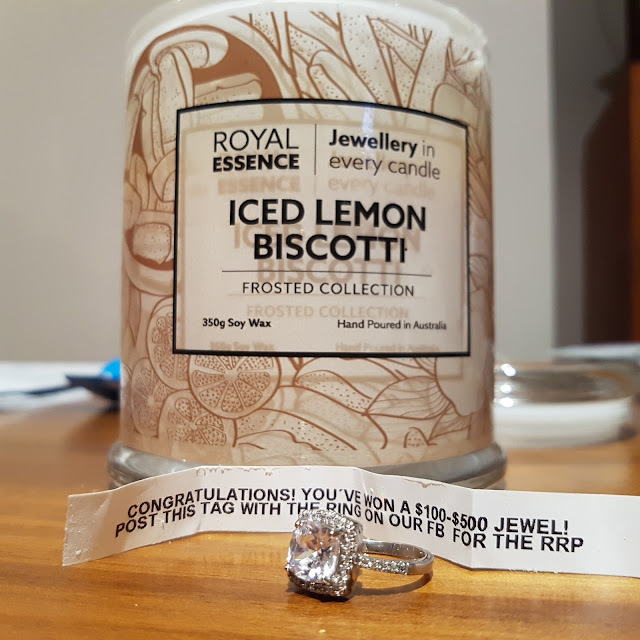 I was kindly gifted a ring candle for review by Royal Essence Australia. Images and opinions are mine and authentic. For more information, please see my PR & Media policy.